Sleep apnea devices are prescribed regularly for the thousands of individuals who suffer from obstructive sleep apnea. Because this condition can be both a serious detriment to sleep as well as potentially life threatening if not treated properly, it is essential that treatment be received as soon as the condition is diagnosed. The sooner you take steps to address the effects of sleep apnea, the better you'll be able to rest. In obstructive sleep apnea the muscles around the tongue and throat tend to relax, causing the soft tissue in these areas to block the airways during sleep. Not only can these episodes of obstruction be disruptive to your sleep as they tend to happen frequently throughout the night, but they can also become very serious as the air supply to the lungs is cut off. In most cases, doctors will recommend the use of sleep apnea devices in order to prevent the obstructive episodes. There are two basic types of devices used regularly for treating sleep apnea: breathing machines and dental appliances. Each of these work to prevent the relaxation of the muscles and the collapse of soft tissue in their own unique way and both have proven quite successful with most sleep apnea patients. By far the most common and effective devices are breathing machines such as the Continuous Positive Airway Pressure, or CPAP device. This is a machine that couples a motor for blowing air with a mask that fits over the mouth or the nose and mouth. The goal is to provide constant positive pressure on the throat throughout the night in order to keep the airway open. CPAP machines come in a number of sizes and styles, and all are lightweight and quiet so that you can easily take yours with you when you travel and the noise won't keep you or your partner up at night. It can take a little time to get used to the restrictive feel of a CPAP machine, but it is easy to see why this is among the most recommended of sleep apnea devices. The effects are almost instantaneous and can include reduction of snoring, lowered blood pressure, improved quality of sleep and less daytime sleepiness. 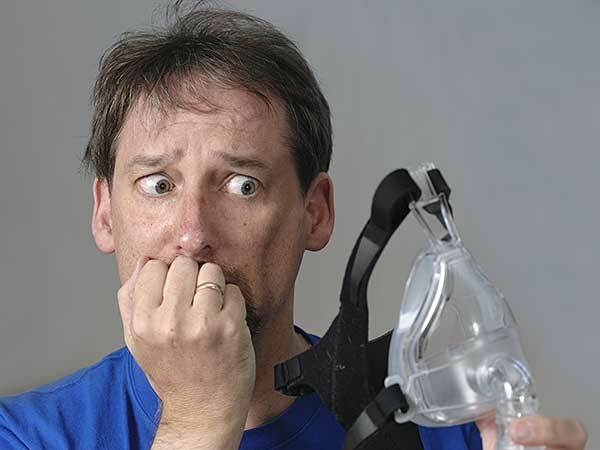 If you have problems getting used to your CPAP machine, you should talk to your doctor who may be able to make some adjustments to make it more comfortable. For individuals with more moderate cases of sleep apnea, dental appliances may be the answer. These are specially designed devices that resemble athletic mouth guards but are intended to provide particular correction to help prevent airway blockage during sleep. Either a Mandibular Advancement Device (MAD) or a Tongue Retaining Device may be used to help ease symptoms and promote healthy sleep. In either case, these particular sleep apnea devices should always be fitted properly, as it is crucial that they conform specifically to your own mouth. The MAD is used to adjust jaw position in order to keep the airway open while the Tongue Retaining Device holds the tongue in place in order to keep it from blocking the airway. In either case, the devices can help to reduce snoring and improve overall quality of sleep. Sleep apnea can be a problem for many people but it doesn't have to prevent you from getting the sleep you so desperately need. If you're experiencing the symptoms of sleep apnea, see your doctor as soon as possible so that he can make a proper diagnosis and recommend a device to help you get back to sleep. Can An Anti-Snoring Mouthpiece Improve Your Sleep?